A domestic pump for discharge of waste water from kitchen and utility rooms. 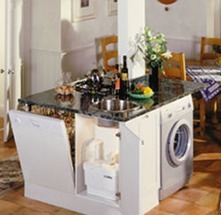 Specially designed to deal with the hot soapy pumped waste water from dishwasher or washing machines, making the addition of a domestic kitchen or utility room easy, even when below or distant from a drain. 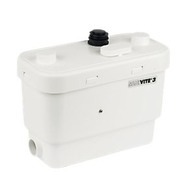 Sanivite is a powerful pump with four inlets for connection to sinks or appliances. Waste water is pumped through 32mm small-bore pipework, vertically up to 5 metres or horizontally up to 50 metres or a lesser combination of both. The compact Sanivite is usually concealed in a kitchen unit but can also be concealed behind a demountable panel to give access if required. H x W x D: 350 x 375 x 185mm. Connects to 32mm discharge pipe.